In this post, We have start learning how can we send user activation email after completing user registration. Because if you have created an account on any website and have you verify you email by click through a verification link send by website for activate or verify email which you have enter email at the time of registration. 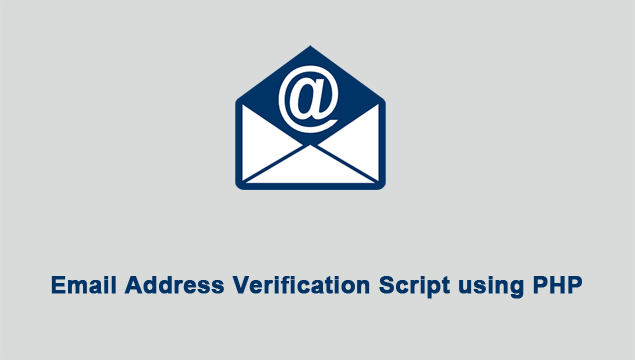 So we have make this post to learn how can you build an email verification script step by step. This is email verify PHP script in which you allows you to verify your email address at the time of registration. This email verification script used at the time of new registration or this script also required when in your site has rss subscription, then use has enter email for subscribe rss feed. So email must be original and reduce spam. So At that time we want to verify email address by sending verification link to that email address. Here we have use simple PHP registration example to verify email address by sending email activation link to their account and by clicking on that link email will be verified. For make this script we have use PHP PDO script with Mysql Database and for sending email we have use PHPMailer Library. In this script user can register into site by entering proper email and after register with email address, then they will received email verification link into their email address. So if email will be proper then he will received email verification link. If user not verified their email address then he cannot login into site. For access website user want to verify their email address. This script helpful to reduce spam registration into website. For email verification user has go to email account and in his email address he will received email verification link with password. So user can verify email by clicking on that link. After email verification user can also received password in his email also. After this email verification user can login into system. This way we can verify email address for reduce span registration by using PHP PDO with Mysql Database and PHPMailer Library. <p>Please Open this link to verified your email address - ".$base_url."email_verification.php?activation_code=".$user_activation_code." how to set SMTP in localhost? because when I try this method, it could'n send any code to my email. you should download composer from GitHub https://getcomposer.org/ and then open your command prompt and choose your drive and Xampp folder in which you want to upload the phpmaler class and then run the "composer require phpmailer/phpmailer" command on your command prompt and then include the 'vendor/autoload.php' in your php mail code then it will work. nice article. but how PHP Registration Script with Phone Number Confirmation. Please Help Me. Hi. Nice Tutorial. I cant send email. I think phpMailer not send email but i can add data in database. Maybe the problem is the phpMailer.